While Maryland ranks 42nd in the nation in terms of geographic size, it packs a punch when it comes to the jobs in the culinary industry. There are over 11,100 eating and drinking places in the state and over 244,000 restaurants and food service jobs. That number is expected to grow by another 23,000 by 2026. The demand for educated culinary professional will be on the rise as hiring managers seek out talented applicants for the restaurants and dining establishments. 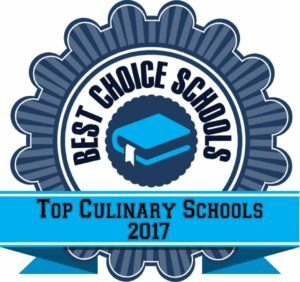 We developed a list of the top 10 best culinary schools in Maryland. It is important to select a quality program that offers hands on instruction, professional instructors, and a variety of coursework. Several schools in our list are accredited by the American Culinary Federation, indicating academic rigor. We reviewed schools offering credentials at all levels and determined that these were the best in Maryland. J. M. Tawes Technology and Career Center features a two-year culinary program with hands-on instruction in restaurant organization, sanitation, cost management, kitchen skills, nutrition, butchering, and pastry art. Students complete coursework during their first year to develop a solid foundation of knowledge and apply that knowledge in the second year of study by preparing lunches and working at catering functions. The program is accredited by the American Culinary Federation. Graduates are prepared for entry level positions in the culinary field and are well positioned for advancement opportunities. The Carroll County Career and Technology Center features a culinary arts and pastry program with instruction in sanitation, food production, menu planning, and purchasing. Both programs are accredited by the American Culinary Federation. Students have the opportunity to gain professional skills by working in the Café and Grill as well as the catering area. Advanced culinary students are able to select a Baking or Pastry concentration or Professional Cooking. Frederick Community College is home to one of the finest culinary instructional facilities in the state. The FCC Culinary Arts and Hospitality Institute features a 40-seat restaurant, an a la cart kitchen, and an instructional kitchen that has enough individual work stations for 18 students at a time. The 6,500 square foot facility also contains a 40-seat restaurant and dining facility. State-of-the-art kitchen equipment such as Vulcan commercial ovens, ranges, and oven/steamer combinations allow students to use multiple techniques at the same time. The Associate degree program can be completed in two years and includes an internship opportunity which allows students the opportunity to apply their skills. The Certificate program can be completed in about one year of full time study. Allegany College of Maryland is a top culinary school offering an AAS degree in Culinary Arts that can be completed in two years of full time study. Students learn a variety of skills from coursework that covers areas such as cooking, baking, purchasing, cost control, food merchandising, and food management. Students in the culinary arts program have the opportunity to work in the student operated restaurant by preparing and serving meals to the public. Allegany is accredited by the American Culinary Federation and the Culinary Arts program has been approved by the Maryland Higher Education Commission. The Lincoln Culinary Institute features culinary training with an international flair. This top culinary school offers hands- on training in French, Asian, and Mediterranean cooking. Students spend time perfecting their culinary skills in a state-of-the-art kitchen laboratory with all the latest tools and gadgets that would be found in a professional kitchen. Students learn all the latest cooking methods including SousVide, thermal immersion, and study the science behind taste, texture, and aroma. This program is accredited by the American Culinary Federation. L’Academie de Cuisine is a top accredited culinary school featuring both a Culinary Arts Professional Program and a Pastry Arts Professional Program. Culinary Arts students complete classroom study and a 26 week paid apprenticeship working under a professional chef. Students can complete courses in the daytime or the evening and can usually complete in just one year. Pastry Arts students also complete a 26 week paid apprenticeship program in a professional restaurant, hotel, or bakery. Small class size means students will receive individualized attention and support throughout the program. Wor-Wick Community College has a Hotel-Motel Management program featuring a Culinary Arts AAS Degree or Certificate. Students have access to a modern kitchen laboratory with commercial equipment. Students learn to program solve, develop a marketing plan, implement cost control strategies, and create a variety of culinary delights. Coursework covers areas of nutrition, garde manger, international cuisine, and customer service. A field experience is part of the AAS degree program. Students are able to apply their college credits earned at Wor-Wic to the University of Maryland Eastern Shore. Stratford University is a top culinary school featuring flexible coursework (some courses are online! ), a state-of-the-art kitchen laboratory, and small class size. Students can complete their degree or diploma in just 18 months with courses lasting between five and 10 weeks each. Core requirements for the Culinary Arts AAS Degree program include Pastry Arts, Food Science, Dining Room Service, and Hospitality Supervision. Pastry Arts core requirements include plated desserts, confectionary production, artisan breads, and specialty cakes. An externship opportunity is required for all programs so students gain professional work experience. Howard Community College in Columbia features numerous culinary degree and certificate programs to meet the special interests of culinary professionals. Howard Community College is a top culinary school featuring a wide variety of coursework such as International Breads, Plated Desserts, A la Carte Production, and Hospitality Purchasing and Cost Control. An internship is required as part of the AAS degree programs. Certificate programs feature coursework specific to the area of study and can be completed in about three semesters. An internship is also required to complete the Certificate program. Graduates of the Certificate program are prepared to work in entry level positions in the baking and culinary industry. Associate degree program graduates have the knowledge and expertise to work in more advanced positions. Anne Arundel Community College is a top accredited culinary school with a focus on hands-n learning. Students can earn specialty certificates in areas such as Restaurant Cooking Skills, Event Planning and Catering, and Culinary Arts. Students can earn certificates and progress to the more advanced AAS degree program. Students have the opportunity to complete an internship opportunity in Italy working in one of the many fine resorts along the Amalfi coast. Students spend five to six days working in the kitchen and have the opportunity to go on field trips and immersion activities. The Hotel/Restaurant Management AAS in Culinary Arts Operations is accredited by the American Culinary Federation. This degree program is the only program in the state to receive exemplary status.